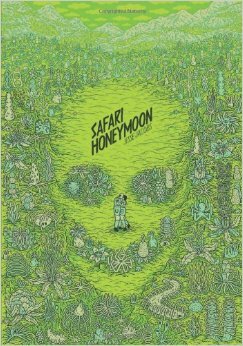 A newlywed couple spend their honeymoon on a safari. They venture deeper into the jungle and revel in the flora and fauna that surrounds them. But some of the wildlife they encounter is a little unusual, and the landscape conjures stirrings within them that go beyond the animalistic urge to consummate the marriage. With a drained palette of pale greens and whites Jacobs creates a richly patterned, monochromatic world of curiosity. Switching between the narrative of the couple and descriptions of surreal biological processions, the bizarre interactions with life forms that resemble the molecular in the peculiar landscape culminates magnificently in an ending that emphasizes a symbiotic, unicolour world. A richly imagined, skilfully crafted wonder world of distinctive beauty.